Tuesday, June 17 will mark the first Blu-ray release of Blue Wild Angel: Jimi Hendrix Live At The Isle of Wight, the enrapturing film that documents the guitar legend’s August 1970 performance before an audience of 600,000. It was the largest show attendance-wise he would ever play and came just 18 days before his untimely death. Blue Wild Angel: Jimi Hendrix Live At The Isle of Wight, is available on Amazon and will be released by Experience Hendrix LLC and Legacy Recordings, the catalog division of Sony Music Entertainment. Blue Wild Angel draws heavily upon Academy Award winning director Murray Lerner’s vast archive of previously unseen performance footage and presents some of Hendrix’s finest ever concert performances, including Jimi Hendrix Experience classics such as “Foxey Lady,” and “Red House,” but also songs such as “Freedom,” “Ezy Ryder” and “In From The Storm” that he was working on for his new studio album just before his passing in September of 1970, in addition to his timeless version of Bob Dylan’s “All Along The Watchtower.” The band kicks things off though with a unique medley of “God Save The Queen” and “Sgt. Pepper’s Lonely Hearts Club Band,” a tune the Beatles themselves never performed in a live setting. England’s Isle of Wight Festival, which had its original run from 1968 to 1970, could be considered the Woodstock of Europe, and it provided the perfect setting for Hendrix’s return to the country that birthed his career, after an 18-month hiatus. This was the first time his new band, consisting of bassist Billy Cox and original drummer Mitch Mitchell, performed on UK soil. In depth interviews with Billy Cox, Mitch Mitchell, and others set the stage for the concert footage that follows. 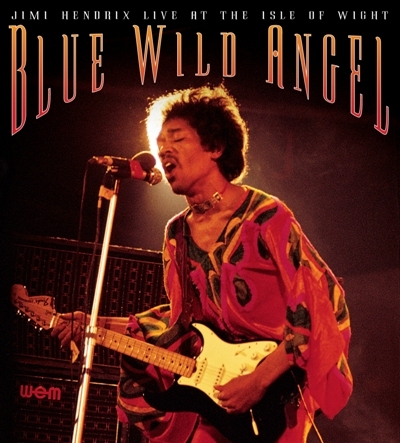 In addition to providing the definitive look at one of the landmark events in Hendrix’s storied career, Blue Wild Angel features both a stereo and 5.1 audio surround soundtrack mixed by Hendrix’s original recording engineer Eddie Kramer.